Successfully Added Motion Detect All-In-One Camera to your Shopping Cart. NATURALTECK MMS Cat Security System contains security technology and the MMS technology of CMCC. Either by I-cable or wireless, the Cat will connect to NATURALTECK server through Internet. And then you can enjoy the services provided by us. 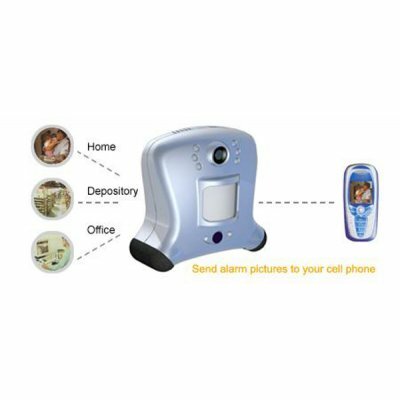 On alarm, the on-spot photo will be sent directly to the user's mobile, and with no alarm error. The photo can also help police detecting. Users can enjoy the services and examine the Cat through PC. Meanwhile, users can examine their houses at anytime, to quickly get the information about whether door and windows are closed, clothes have been taken back and kids are at home etc. So it can further expand the MMS's application, and make MMS the protector of house sate. Besides, the Cat contains GPRS Wireless Module, so it can be used in the moved settings like cars and ships; NATURALTECK security system is an intelligence monitor and alarm general system. This system can run independently or update and expand to form a large security system. You can link to the alarm center of 110/119 and so on, to ravel out the alarm immediately. You can also link to videoconference system, hold videoconference on net. The system has the characteristic of powerful expansibility and compatibility..